Omayad Palace, 8th Cent CE. 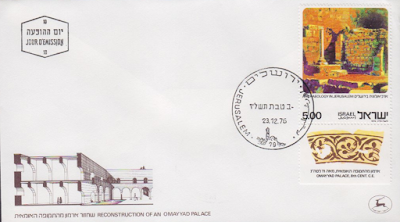 At the foot of the Temple Mount is this palace (reconstruction depicted on cachet), and on the stamp, a room from the Caliphs palace's ground floor. On the tab, is decorated plaster found in this palace. City wall 1st Temple Period 7th Cent BCE. This section of the defensive Broad Wall (up to 7m thick! 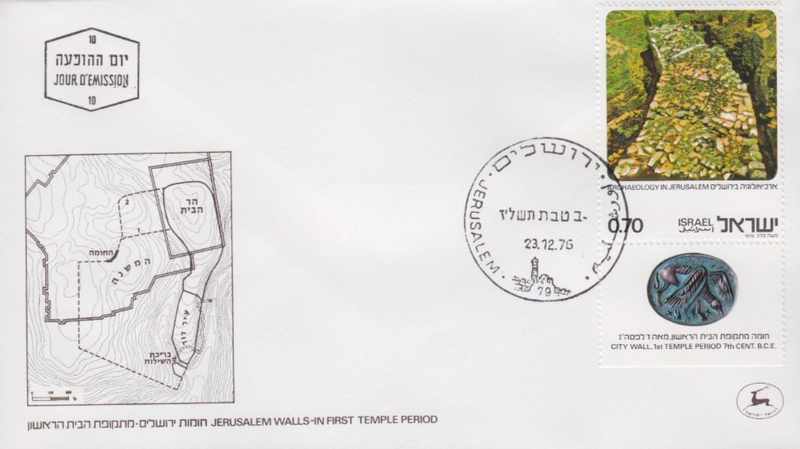 ), found in the Jewish Quarter, is seen as important as it delineates the Jerusalem city limits as they were during King Hezekiah's reign. Issued December 23 1976.